‘Scream’… if you wish you'd won this commission. A new 13-track album from the late king of pop Michael Jackson is set to drop later this month. And who better to design the art than UK illustrator and king of posters Matt Taylor? 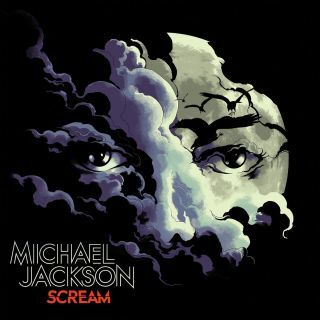 According to Sony Music, Michael Jackson: Scream will be a collection of the singer's “all-time most electrifying and danceable tracks including Ghosts, Torture, Thriller, and Dirty Diana." No pressure for Taylor, then, who tweeted earlier this week that he's the man behind the album's cover art. The final artwork is hauntingly stunning – which is appropriate, given the September 29 release is just in time for Halloween. MJ’s eyes stare out of a partially obscured full moon that uses negative space to craft layers of eerie texture and meaning. Some shapes cut recognisable silhouettes – the descending crows, for example – while others suggest creepy, otherworldy creatures lurking in the shadows. In the lower left-hand corner, inline text introduces the artist, with the blood red title, Scream, breaking the limited colour palette. Scream posters reportedly first appeared in Germany. Jackson's official Twitter account, @michaeljackson, teased a 15-second-long video on Monday that featured black cats, full moons and other imagery commonly associated with Halloween. You can watch it below.